"When we are unhurried and wise, we perceive that only great and worthy things have any permanent and absolute existence, that petty fears and petty pleasures are but the shadow of the reality." Long before humans had mirrors in which they could see their reflections, they could see their shadows, the dark shape cast by the blockage of light that seemed to have an evanescent materiality all its own. The great seers of India who had realized the Pure Light of Consciousness described the whole manifest world as layers upon layers of shadows, giving the illusion of solidity but ultimately dissolving back into Pure Light. But here in duality, things are split into oppositional pairs - good/bad, sadness/joy, light/dark. And those things that are dark, we call shadows. Shadows by their very nature are difficult to see. They are dark, murky, evanescent and have only a dim outline. Like a reflection in the mirror, they have no substantiality of their own. They only indicate the presence of substantiality located somewhere nearby. When we see a large shadow appear on the ground we instinctively look to the sky to determine the nature of its origin. When it comes to addressing the shadows within our own selves we often deny or avoid the same instinct that could show us what is blocking our own light from within. Jyotisha, a cognate Sanskrit word made up of "jyoti," which means "light" and "isha," which means many things but could be translated as both "lord" and "power," is the study of the Law of Light and therefore shadows as well. When well practiced, the purpose of Jyotisha is to help an individual understand themselves and their circumstances both light and dark. Although Jyotisha (Jyotish) is renowned for the ability of some of its practitioners to make stunningly accurate predictions through their prodigious understanding of the laws of light and shadow, my guru would always say that the most valuable thing you can get from a good Jyotishi is insight into your own nature which will help to liberate you from having to live within its confines. While analyzing any planet in a horoscope can be a huge source of insight, there are particular planets and planetary conditions that tend to really indicate arenas of life and psyche in which a person has a particularly pernicious blind spot, a strong shadow. Planetary states giving rise to such a condition include exaltation, debilitation, combustion and sandhi. Those states will be covered in another article. The focus of this articles is the shadow planets. The three shadow planets (or chaya grahas) are the two nodes and Saturn. The nodes are full chaya grahas, lacking a substantive body but giving powerful effects, noticeably altering the light of the Sun and Moon who give our world its rhythm of time. Saturn is a half chaya graha, the child of the Sun and his wife, Chaya. Everyone has a blind spot but people with very potent placements and/or combinations involving the shadow planets will frequently demonstrate a disproportionately large blind spot, a shadow so big it looms over others and diminishes their own access to light and truth. In the indirect manner of shadows, through recognizing others' blind spots, we may gain some intuition about our own as well, and that intuition is badly needed. It is almost inevitably our blind spots that lead us and those we claim to love into avoidable suffering, even if our blind spots seem small in comparison to those of others (which they usually do). No one feels the shade cast by their own shadow. Right now (May 2012), all three of the shadow planets are in an exaggerated condition. Rahu and Saturn are exalted and Ketu is debilitated, giving extra momentum to the appearance of shadows in our worlds, both individual and collective, which makes it an ideal time to consider the shadow. When we look into our shadow, we usually acquire seemingly new information that is surprising, healing and useful, for within it often lies the key to our liberation from suffering, a key that almost never looks like what we imagined to be, because it comes from a hidden and mysterious place and is usually opposite to what we consciously project. Dictators are usually strong shadow holders. They block out the light and joy of entire nations while purporting to do the opposite. The most famous exemplar of this fact is Adolf Hitler, who saw his mission as the upliftment of Germany but failed to see clearly enough to enact that in a healthy way. Hitler's childhood was an absolute nightmare. He was severely beaten and humiliated by his father on a daily basis. If he had looked into his shadow, he would have seen a severely traumatized frightened helpless child -- but he did not. Instead, he projected his shadow onto the world in the form of the ruthless power he himself had experienced. 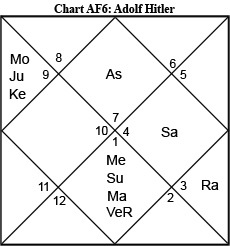 In Hitler's chart, Saturn sits in the tenth house. According to Jyotish master Narendra Desai, anyone with Saturn in this position will demonstrate dictatorial tendencies because Saturn aspects both the twelfth house of the unconscious mind and the fourth house of the emotional mind, and represents control -- therefore, being over-controlling will be a huge blind spot. This is exponentially true in Hitler's case for a variety of reasons. Saturn is the fourth lord and the fifth lord of the intellectual mind. He himself is in tight mutual aspect with Mars who in turn is in a planetary war with lagna lord Venus who is closely afflicted by both Saturn and Mars. Saturn also aspects the Sun and Mercury, leaving only Jupiter and Moon unaspected. However these two planets are under the influence of the nodes, the other shadow planets, leaving his entire personality under the weight of a shadow so big it cost ten million people their lives. Another group famous for the size of its shadows while seeking after the light, and sometimes even emanating it, are cult gurus. Jim Jones has the dubious distinction of having effected the single largest mass suicide by followers of a cult leader ever. Over 900 people drank poisoned Kool-Aid on November 18, 1978. In retrospect, it is easy to paint him as entirely demonic but at the time he existed, he actually was a proponent of many forward thinking ideas like racial integration, equality and service to others. Clearly, it all went wrong as his shadow began to take over his entire operation, turning it to selfish and cruel ends. A Sagittarius with an unafflicted Jupiter in the seventh, he may have had some true idealism in the beginning. 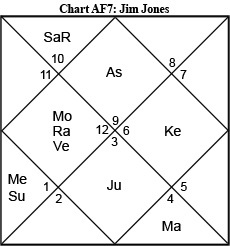 But he also had a potent Rahu in the fourth house with Venus and the Moon. That combination is aspected by a Rx sandhi Saturn in the second house in its own sign of Capricorn. Saturn also aspects his debilitated Mars in the 8th house, creating a confusing notion for Jones around the place and importance of death. It was during Moon-Rahu that the mass suicide took place. (c) copyright 2012 Michael Laughrin. From the Apr/May 2012 issue of Michael Laughrin's North American Jyotish Newsletter. Click to subscribe to this free Jyotish newsletter.